Aside from the fact the oven was broken, they were out of iced tea, and I had to ask for them to put out more pickles, we managed to score a pretty good deal on lunch. 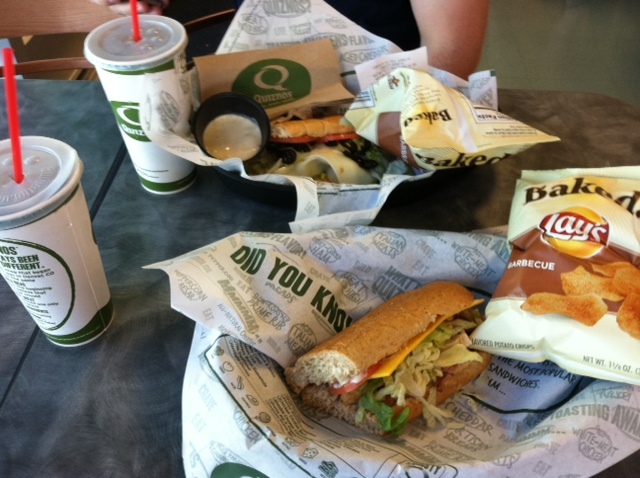 For $9.99 we got two small subs, two bags of chips and two fountain drinks. The Regular price $14.20, in other words, we saved over $4 on lunch with coupon, and it was actually stuff we would have ordered anyway. Now just imagine if Quizno’s #4488 hadn’t been having the worst day in history! The coupon is good through August 8th, so don’t hesitate to print it out and get this deal yourself. Thanks for the tip on this one: The kids and I hipster coupon-ed it over to the original Quiznos location in Denver last night for dinner on your tip, squeaking in just before the expiry. Copyright © 2011-2019 Hipster Couponing All rights reserved.